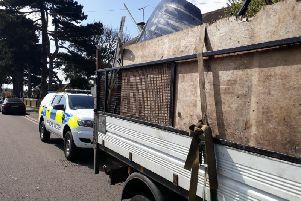 A Hungarian man has been arrested after suspected illegal immigrants were found in the back of a lorry in Toddington. East of England Ambulance were also at the scene, where the 13 people received medical treatment. Immigration Enforcement was then contacted by police. A Home Office spokesman said: “The group will be passed into the custody of Immigration Enforcement for their cases to be progressed. “A 42-year-old Hungarian man was arrested on suspicion of facilitating illegal immigration. He is currently in custody pending interview by Immigration Enforcement.